Two cosmonauts took a spacewalk outside the International Space Station Monday (June 24) to prepare the orbiting outpost for the arrival of a new Russian laboratory later this year. Clad in bulky Orlan spacesuits, cosmonauts Fyodor Yurchikhin and Alexander Misurkin spent more than six hours outside the space station to test automated docking system cables and install equipment to aid the arrival of the new Russian Multipurpose Laboratory, a science module slated to launch to the orbiting laboratory by the end of 2013. 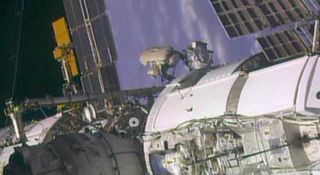 The spacewalk began at 9:32 a.m. EDT (1332 GMT). Still, it wasn't all work and no play for the hard-working cosmonauts. "Can you make the sun not shine so bright?" one of the spacewalkers joked during the orbital work. "It's shining right in my eyes." Yurchikhin and Misurkin are part of the space station's six-person Expedition 36 crew. Their crewmates — fellow cosmonaut Pavel Vinogradov, NASA's Chris Cassidy and Karen Nyberg and European Space Agency astronaut Luca Parmitano — remained inside the International Space Station during the spacewalk. Misurkin and Yurchikhin were lighthearted during the six hour and 34 minute excursion. They joked with Russian Mission Control about being hungry, paused occasionally for a photo and commented on the beauty of the Earth from space. "I guess we're flying over South America," one of the spacewalkers said at one point. "Gorgeous." Aside from the new module preparation work, the cosmonauts also replaced a fluid control valve panel on the Zarya module, installed a new science experiment on the exterior of the orbiting laboratory, and retrieved two older experiments. They installed tethers between handholds to be used by cosmonauts and astronauts on future spacewalks, however they weren't able to mount all of them in time. The remaining tethers will be installed during a future spacewalk, NASA officials said. Monday's spacewalk marked the sixth excursion for Yurchikhin, a veteran cosmonaut making his fourth spaceflight. It was the first for Misurkin. Before this spacewalk, Yurchikhin logged 31 hours and 52 minutes of spacewalking time. Six more spacewalks are planned for this year, four Russian and two American. The U.S. spacewalks are scheduled to take place on July 2 and 9. Monday's excursion marked the 169th spacewalk for maintenance and assembly performed on the $100 billion orbiting laboratory. The International Space Station was built by 15 countries represented by five space agencies, and construction began in 1998. It has been continuously staffed by rotating crews of astronauts since 2000.